A website to report research on Earth's largest volcano. Mauna Loa makes up about half of the Big Island of Hawai'i. The mountain has been designated a "Decade Volcano" by IAVCEI (along with fourteen other volcanoes worldwide) in recognition that it provides an excellent locale for studying volcanic processes and volcanic hazards. This web page results from meetings of Mauna Loa researchers and interested parties at American Geophysical Union meetings in 1993 and 1995. At the 1995 meeting, the hope was expressed that all ongoing Mauna Loa studies will eventually be linked to this page. The rationale behind the Decade Volcanoes program, a component in the International Decade for Natural Disaster Reduction, is available at the IAVCEI page Mitigation of Volcanic Disasters. 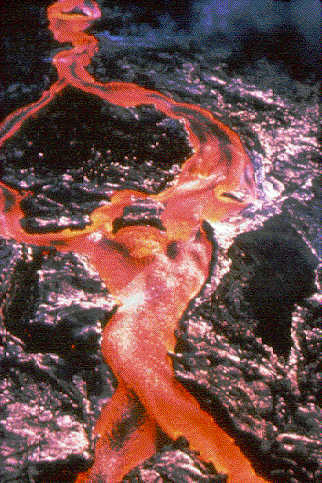 The accomplishments of the Decade Volcano program were summarized in a Status Report to IAVCEI presented by Chris Newhall, USGS, in January 1996. Images, articles, earthquake maps; here are links to other information about Mauna Loa. For additional links, check Boris Behncke's list of Decade Volcano information.